Whole Lotta Fishing Going On! Days have been pretty warm to down right hot! Almost every day has had a chance for showers and some days we would get a few sprinkles and some days not. Continued warm through the week, with temperatures moving into the 90 by the weekend. Of course, we have a chance for showers every day until next week when it looks like zero chances for a few days. No generation almost every morning last week. Yesterday was the exception as they ran water almost all day and a lot of it yesterday afternoon. It is off this morning, as projected, and should come on around 3:00 this afternoon. We are at power pool, so we might see the same pattern this week as last….off during the morning and coming on some time in the afternoon. Will have a better feel for this later today when we see tomorrow’s projection. Lots of trips over the past several days. Last Wednesday, Stan had Ron and his son, Brian out for half a day. Good day for these guys on the copper dun, fire fly and P&P. Jim had Ed and Don, from Arizona out all day. They had a good day pulling the CQ streamer. Jeff and Aaron fished with Darrell. The big ruby was their bug for the trip. Thursday, a couple guys from Oklahoma, Lynn and Jason spent the morning with Jim. Pretty good day on the CQ streamer, the copper dun midge and a blood worm. Stan had Gary and Bob, also from Oklahoma, out for the first day. They went out again on Friday. Good day for these two on the copperhead black midge, copper dun and P&P midges. We emptied the shop Friday. Dana had Fred and Ruth from Texas out for the morning. P&P and crackleback for these fishers. Carolyn took Wanda. Almost all her fish were on the blood worm dropped under the peach fur bug and a few on the copper dun midge. Mike from Oklahoma had the morning with Jim. P&P, blood worm and hot hare’s ear were their patterns. Darrell and Gina had a group from Texas. Karl floated with Darrell and they did best on the P&P midge. Marsha and Bonnie were with Gina. They were throwing the copper dun & P&P midges. 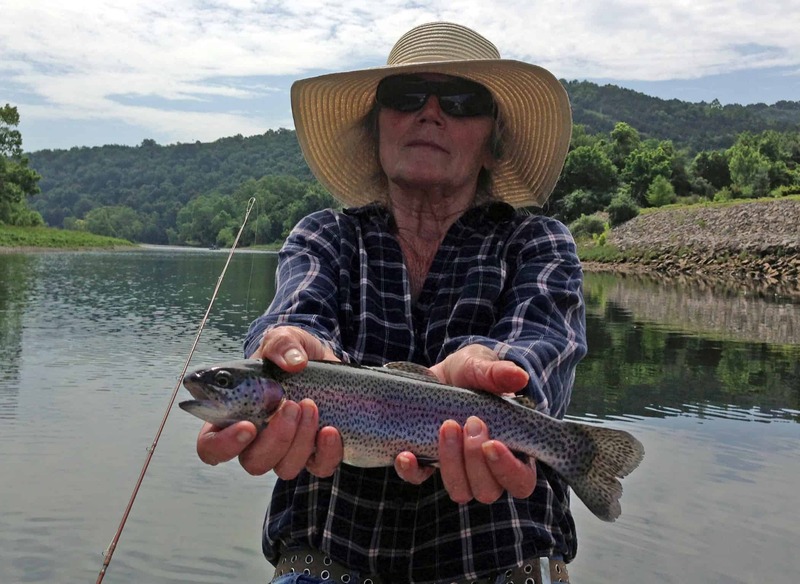 Marsha’s brand new to fly fishing and it was Bonnie’s second time . This entry was posted on Monday, June 23rd, 2014 at 12:13 pm	and is filed under Fishing Reports. You can follow any responses to this entry through the RSS 2.0 feed. You can leave a response, or trackback from your own site.